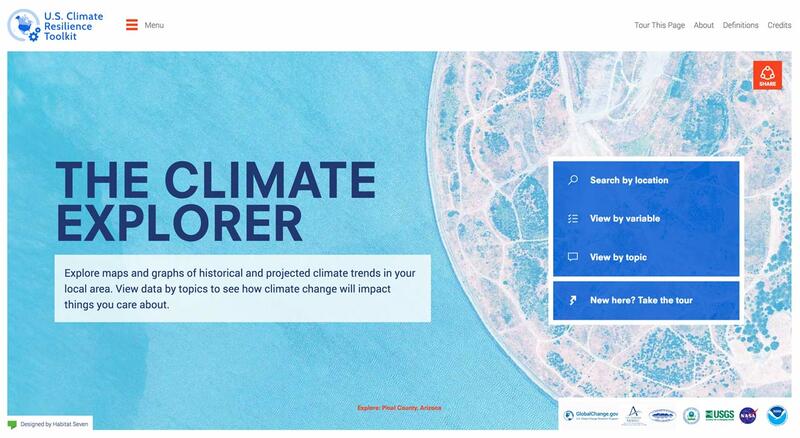 Produced in support of the President’s Climate Action Plan, the Climate Explorer allows individuals, businesses, and communities of all sizes to help them understand how climate conditions in their location may change over the next several decades. This information—derived from global climate models—can help them make decisions and build resilience to extreme events. Built to accompany the U.S. 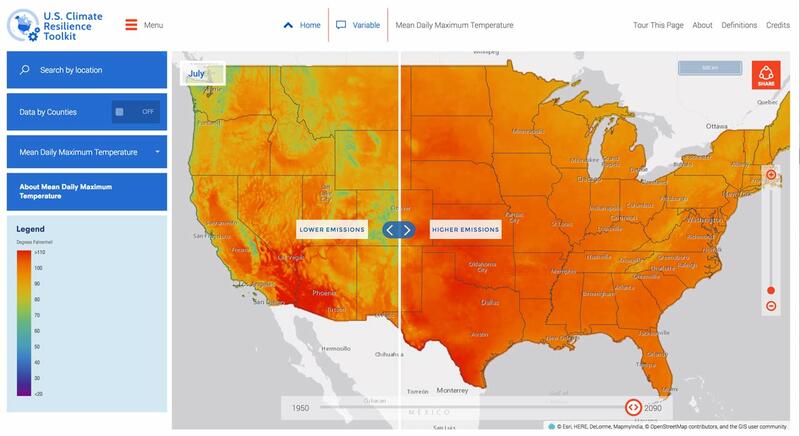 Climate Resilience Toolkit, the Climate Explorer offers customizable graphs and maps of observed and projected temperature, precipitation, and related climate variables for every county in the contiguous United States. Based on global climate models developed for the United Nations Intergovernmental Panel on Climate Change, Climate Explorer’s graphs and maps show projected conditions for two possible futures: one in which humans make a moderate attempt to reduce global emissions of heat-trapping gases, and one in which we go on conducting business as usual. Decision makers can compare climate projections based on these two scenarios and plan according to their tolerance for risk and the timeframe of their decisions. Decision makers facing climate change need tools to help guide their investments in resilience. 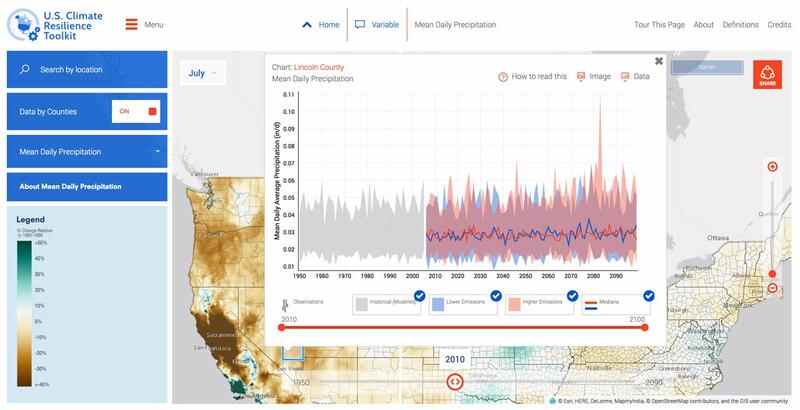 This tool was developed specifically to allow non-climate scientists gain access to climate data and provide them with much needed insights into how climate change is expected to impact the communities and areas they care about. 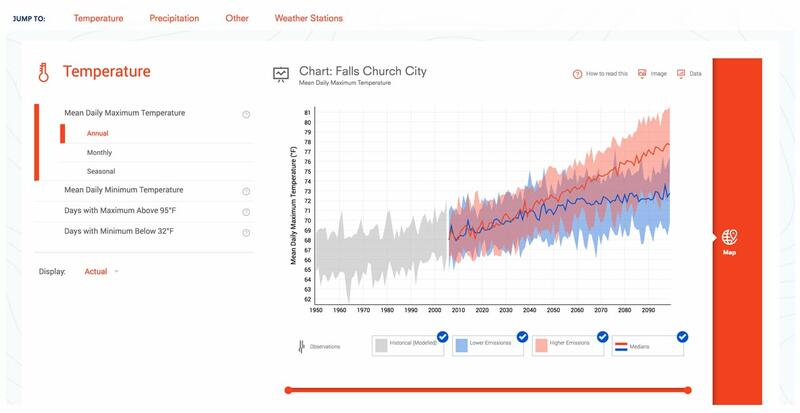 The tool displays climate observations for temperature, precipitation, and related variables for 1950 to the early 2000s. These are averages calculated from quality-checked ground-based weather stations across the country. Users can compare graphs of observed conditions to climate model simulations for the same period: in this case, climate models were initialized to reflect conditions in 1950, and then run through 2005. Comparing the range of observations against the simulations for this period can provide insights on the models’ collective ability to capture the range of observed variability for each climate variable. In some cases, the simulations and observations show a good match. In other cases, these comparisons may reveal consistent biases or limitations of the models. The site was also nominated for a Webby Award under the ‘Best Design Function’ category.